Naimuddin bin Jalaluddin bin Muhammad Nizari Kohistani was born in Birjand in 645/1247. He got the rudiments of his formal education at home from his father, who was also a poet himself and a devout Ismaili. Later on, Nizari attended school in Birjand and Qain, and studied Persian and Arabic literature. His father was a land- lord in Birjand, but lost his estate during the Mongol onslaught in Kohistan and subsequently, Nizari had to serve at the court of Shamsuddin Muhammad I (643- 684/1245-1285), the founder of the Kurt dynasty of Herat; and became a court-poet. Nizari travelled excessively for supervising the revenue and expenditure of Azerbaijan and Arran. He set out from Khasp in Birjand on a long journey with a certain Tajuddin Amid in Shawal, 678/February, 1280. He fell ill in Tabriz, and resumed his journey in Safar, 679/June, 1280 with a certain Shamsuddin Juvaini, who was also travelling there for same purpose. Nizari visited Azerbaijan, Arran, Georgia, Armenia and Baku, which lasted for two years (678-679/1280-1281). Muqaddasi had reported earlier in "Kitab al-Akalim" (comp. in 375/985) that Azerbaijan, Arran and Armenia formed part of a single province, which he designated as Iklim ar-Rihab(the region of high plains). It was during this journey that Nizari did see Shamsuddin Muhammad and his successor. He recounted the account of his journey in his "Safar-nama" in mathnawi form, comprised of 1200 verses. Nizari has termed the Ismailis significantly as "Ikhwan as-Safa". "He is the prince of the universe, the crown of the faith. He is the son of Ali, who is the light of the eyes of the great king (Muhammad). He (Shamsuddin) Muhammad is the father of spiritualism, and the sweetest fruit of the eternal garden of creation." One can hardly paint a true picture of the condition under which the Ismailis lived in different regions after an end of their power. The overt hostility of the general Muslims continued to be unchanged in all corners on one side, and the Mongol sword was hunting them on other. The survived Ismailis were forced to exist in various cloaks, that had made the ostensible appearances so conclusive as if there had been not a single Ismaili on the surface. The underground existence of the Ismailis had become congenial condition for the contemporary historian, like Juvaini (1226-1283) and the traveller, like Marco Polo (1254-1324) to shift the fictions and cheap stories to the account of the Ismailis to win the hearts of their pagan masters. Hence, Iran for the most part became a breeding ground of fictions for bigoted historians. Henceforth, whatever was salvaged of various types of Ismaili works came to be preserved secretly and in private collections. As a result, the history of the Ismailis and doctrines came almost exclusively from the pens of Sunni historians who, as a rule, were hostile towards the Ismailis. Thus, numerous distortions and negative biases are contained in the tracts of these chroniclers. Previously indicated that in the time of Imam Alauddin Muhammad (d. 653/1255), the Mongols were spurring to their operations against Alamut. Shamsuddin, the chief Qadi of Qazwin had also lodged false allegations against Alamut at the court of Mongke (1251-1258) in Mongolia. Halagu therefore had been charged the main Mongol expedition across Central Asia to Iran, where he did not arrive before 654/1256. But already in 650/1252, he had dispatched an advance army of 12000 men under the command of Ket-Buqa, who reached Iran in 651/1253 and began his onslaught on the Ismaili strongholds in Kohistan; and sent raiding parties into Rudhbar and Tarum. On other side, Shamsuddin, the chief Qadi of Qazwin, immediately after returning from Mongolia, assailed in bitter sarcasms against Alamut in Qazwin and the surrounding regions, giving also high tidings for the coming of the Mongols in Iran. The scrutiny of the sources indicates that a bulk of the frightened Muslims calmly began to evacuate the vicinity of Rudhbar and Kohistan during the period of Alauddin Muhammad to escape the main brunt of the Mongols. The stampede of the Muslims had also carried away with them the then latest report that "Alauddin Muhammad is the ruler of Alamut, and the Mongols are about to come to reduce Alamut." These Muslims ultimately settled down in Qazwin, Daylam and Tabriz; where they came to know the fall of Alamut. On that juncture, they seem to have generalized an image in minds that the Alamut's fall would have been taken place in the time of Alauddin Muhammad, incorporating the then report they had brought from their villages. This tradition received credence in some circles, ingnoring palpably the one year rule of Ruknuddin Khurshah followed by Alauddin Muhammad. When the Mongol storms diffused in Iran, the historicity of Ruknuddin Khurshah itself began to be floated. But, it seems that the above idea continued to remain prevailed many years in Qazwin, Daylam and Tabriz, making Alauddin Muhammad as the last ruler of Alamut, which also curiously sounds in the account of Marco Polo (1254-1324), who had most possibly heard these fantastic stories from these orbits in 671/1272. For instance, Marco Polo narrates: "I will tell you his story just as I Messer Marco, have heard it told by many people.... The Shaikh was called in their language Alaodin.... So they were taken, and the Shaikh, Alaodin, was put to death with all his men." (vide "The Travels of Marco Polo" by Ronald Latham, London, 1958, pp. 40-42). When Shamsuddin Muhammad had been in Tabriz once or more times, he became known as Shams Tabriz. There had been another Shams-i Tabriz, the master of Jalaluddin Rumi (d. 672/1273) in the same period, who was not tracable after 645/1247 in Koniya. It is therefore possible that Shamsuddin Muhammad had chosen to cloak his identity in Tabriz for some times under the name of the master of Jalaluddin Rumi in the Sufic circles. Rida Quli Khan (d. 1872) writes in "Majmau'l Fusaha" that, "Shaikh Abu Hamid Awhadu'ddin Kirmani had seen and met Shams-i Tabriz in Tabriz." To this we must add the likelihood that Shaikh Abu Hamid had veritably seen Shamsuddin Muhammad in the mantle of Shams-i Tabriz. When Shamsuddin Muhammad was identified as the "son of the last ruler of Alamut", he was ultimately considered as the "son of Alauddin Muhammad," incorporating him in the above tradition. A cloud of mystery has surrounded the life of another contemporary Shams-i Tabriz, the master of Jalaluddin Rumi after 645/1247. Shamsuddin Aflaki, who wrote in 754/1353 that the death of Shams-i Tabriz took place in Koniya in 645/1247. It seems that a group of the Sufis had cultivated a story that after leaving Koniya, Shams-i Tabriz had gone to Tabriz, and there Shamsuddin Muhammad, known as Shams Tabriz had been identified as same Shams-i Tabriz after few years. Thus, Shamsuddin Muhammad began to be equated with that of Shams-i Tabriz, and henceforward, two Shams Tabriz at one period were confounded. When the people conclusively identified Ruknuddin Khurshah as the last ruler, most probably after 671/1272, one another tradition seems to have been originated to distinguish these two characters. Shamsuddin Muhammad had been deleted from that story from being the son of Alauddin Muhammad, but Shams-i Tabriz was made known as the son of Alauddin Muhammad instead. Being influenced with this tradition, Daulatshah (d. 900/1494) was the first to show Shams-i Tabriz, the master of Jalaluddin Rumi as the son of Alauddin Muhammad, in his "Tazkertu'sh Shu'ara". A question then arises, who was Shams-i Tabriz? He indeed was an Ismaili, the master of Jalaluddin Rumi, but not the son of Alauddin Muhammad. As to the early life of Shams-i Tabriz, we are yet in dark. Shamsuddin Aflaki (710-754/1310-1354) in "Manaqibu'l Arifin" and Abdur Rahman Jami (d. 898/1493) in "Nafhatu'l Uns" concur that Shams-i Tabriz was the son of a certain Muhammad bin Ali bin Malikad. Rida Quli Khan (d. 1872) in his "Majmau'l Fusaha" also relied on Aflaki and Jami. 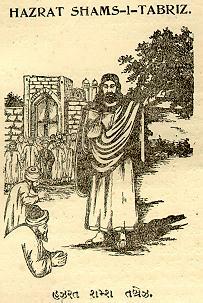 According to "Silsilatu'ad-Dhahab", it is wrong to allege Shams-i Tabriz to have been the son of Alauddin Muhammad. It was only Daulatshah (d. 900/1494) who made him the son of Alauddin Muhammad being influenced by the wrong tradition. Prof. Muhammad Iqbal of Punjab University, who prepared the Lahore edition of Daulatshah's work, makes his remarks that: "...it is evident that Daulatshah has not written historical facts carefully in his book. He has accepted all sorts of traditions, right or wrong, owing to which several errors have crept into his work." Edward G. Browne writes in "A Literary History of Persia" (3rd vol., p. 436) that, "This is an entertaining but inaccurate work, containing a good selection of historical errors." It is also worthy of notice, however, that Daulatshah quoted another tradition of parentage of Shams-i Tabriz that, "Some people say that he was originally a native of Khorasan and belonged to the town of Bazar. His father had settled in Tabriz for the purpose of doing business in cloth." It is probable that Shams-i Tabriz was the son of Muhammad bin Ali bin Malikad according to Aflaki and Jami, and he seems to be a native of Khorasan as per another tradition cited by Daulatshah. Nurullah Shustari (d. 1019/1610) in his "Majalis al-Mominin" (6th vol., p. 291) states that Shams-i Tabriz descended from "Ismaili headman" (da'iyani Ismailiyya budand). His father had settled in Tabriz, and was a cloth merchant. Shams-i Tabriz was indeed an Ismaili like his father, but it needs further scholarly scanning to trace his biography. There is also a reason to believe that Jalaluddin Rumi must have been known both Shams-i Tabriz and Imam Shamsuddin Muhammad, but did not described palpably in his Diwan. He however addresses Shams as the heir of the Prophet (verse no. 2473) and compares him to Ali (verse no. 1944), which seems to have been referred only to the Imam. Shamsuddin Muhammad is reported to have betrothed to a Sufi lady at Daylam in 675/1276, or next year. His sons, Momin Shah and Kiya Shah penetrated Ismaili dawaas far as Gilan. Momin Shah also travelled in Syria and served many years as a hujjat of the Imam. When he returned to Gilan, a section of the Syrian Ismailis, considered him the Imam's successor, who later on, became known as the Momin-Shahis. Muhibb Ali Qunduzi however writes in "Irshadu't Talibin" (comp. in 929/1523) that, "The schism took place after the death of Momin Shah in 738/1338." The descendants of Momin Shah mostly lived in Khwand, a village in Qazwin, where they became known as Sadat-i Khwandia. Shamsuddin Muhammad died in 710/1310 in Azerbaijan after vesting the office of Imamate in Kassim Shah. It appears that the Ismaili sources have designed the history of the Imams in a sequence of father to son, emanating each succeeding Imam being the son of the preceding Imam. We have been told in this context that Kassim Shah was the son and successor of Shamsuddin Muhammad. But, the scrutiny of the sources and the fragments of the traditions, reveals starkly a different story, suggesting that Kassim Shah was the successor, but not a son, rather a grandson of Shamsuddin Muhammad. In other words, he was Kassim Shah bin Momin Shah bin Shamsuddin Muhammad. The chronicles of Momin Shahi sect, such as "Irshadu't Talibin" (comp. 929/1523) by Muhibb Ali Qunduzi and "Lamat al-Tahirin" (comp. 1110/1698) by Ghulam Ali bin Muhammad; contain variations in the names of the descendants of Shamsuddin Muhammad. "Tarikh-i Firishta" (comp. 1015/1606) by Muhammad Kassim Firishta, and few other sources also offer a diverse account of the sons of Shamsuddin Muhammad. These sources however divulge some traces that Shamsuddin Muhammad was succeeded by his grandson, Kassim Shah bin Momin Shah. It is worthwhile that "Haft Bab" of Abu Ishaq Kohistani, who died in the beginning of the 10th/16th centuries, places Momin Shah in the list of Imams, making him the successor of Shamsuddin Muhammad, and Kassim Shah as the successor of Momin Shah. It ensues from the episode that Abu Ishaq Kohistani must have identified Kassim Shah being the grandson of Shamsuddin Muhammad in his period, and had inserted the name of Momin Shah between them, to adjust the succession list in an order, and to give coherence to the traditional notion. Later on, it seems that the Ismailis, after knowing Kassim Shah being followed by Shamsuddin Muhammad, had omitted the name of Momin Shah in the list to distinguish themselves from Momin Shahi sect. 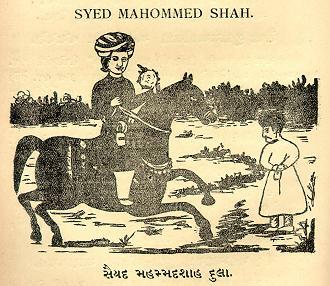 It resulted possibly the historicity of a grandsontransformed into a son, and one can find the like effect in India in "Satveni'ji Vel" by Sayed Nur Muhammad Shah (d. 940/1534). In sum, it ensues that Shamsuddin Muhammad seems to have succeeded by his grandson, Kassim Shah. Besides, the tradition of the succession of a grandson can be seen equally potent in the famous Will of the Aga Khan III, who has unmasked the succession of the grandson in the light of the past tradition while appointing his grandson to succeed him. It reads: "Ever since the time of my ancestor Ali, the first Imam, that is to say over a period of thirteen hundred years, it has always been the tradition of our family that each Imam chooses his successor at his absolute and unfettered discretion from amongst any of his descendants, whether they be sons or remote male issue...." This would thus tend to be a safe conclusion that the appointment of a grandson (the remote male issue) was enfoced in view of the tradition of last 1300 years, and thus it was not a new effect in this age. It unveils in a question that a like effect most probably had been taken place in the line of Shamsuddin Muhammad, who seems to have been succeeded by his grandson, Kassim Shah bin Momin Shah. W.Ivanow (1886-1970) and Farhad Daftary and other modern scholars have also shown almost pertinent possibility. The ardent students must investigate this field to unearth further historical truth.